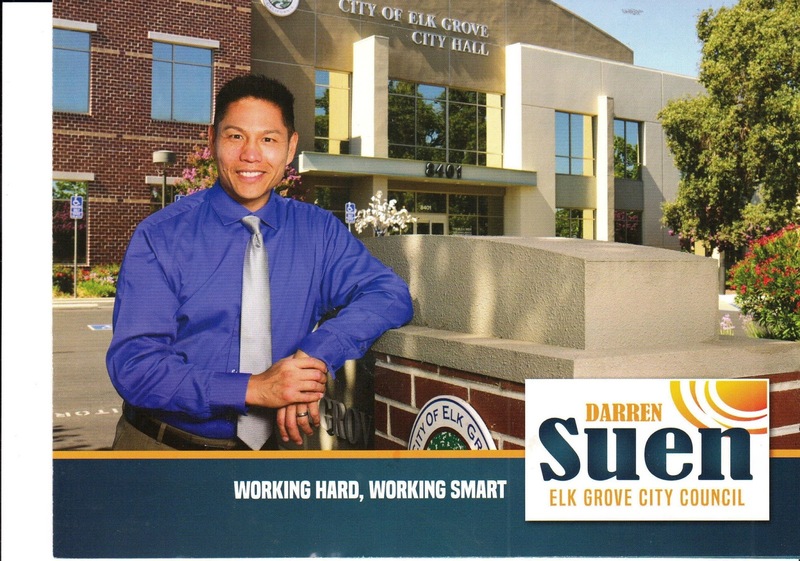 Even though he easily won a four-year term last November against a phantom opponent, Elk Grove City Council Member Darren Suen continued his fund raising effort into 2017. According to financial disclosure forms filed with the Elk Grove City Clerk's office, for the six month period ending June 30, 2017, Suen raised $27,015. With those additional funds, Suen ended the reporting period with a hefty $60,400 in his campaign account. Other notable contributions received $250 from Elk Grove City Council Member Stephanie Nguyen. The donation from his council colleague is reported as an individual contribution, not a campaign fund, which Nguyen has not to date established. Among the $16,820 expenses paid by Suen during the period was $15,113 to Sacramento-based Capitol Campaigns for fundraising events and campaign consultant work. Additionally, Suen also reported accrued expenses of $13,803 with Capitol Campaigns. If anyone thinks Suen isn't running for Mayor of Elk Grove in 2018, they are sadly mistaken. He can deny all he wants but it is clear Suen is raising money to do just that to get out ahead of Ly. Interesting that Nguyen gave Suen money. Looks like she has already fallen in line with the boys. I can hear it now from Suen, "Many people have approached me to run. . ." Blah, blah, blah. And Hume and Detrick have nothing to do with talking Suen into running to take out Ly so they can totally control the Council by yet another appointment of a preselected "chosen one." Yeah right! And a question for Stephanie Nguyen: Was that contribution to Darren Suen a thank you for your appointment? If not, bad optics either way because the Elk Grove City Council members should at least "pretend" to stand on their own and not be in each other pockets; or in this case, in each other's campaign accounts or both. I wonder how much Suen will be contributing to Nguyen and if she will be endorsing him for Mayor in 2018. If Ly were smart, he would find someone to run in District 4 to break up this cozy alliance. With, Suen, Hume, Detrick and now Nguyen, that Council bed must be a California king by now!